Umpqua Indian Foods is a manufacturer of foods operated by Umpqua Indian Development Corporation, a business run by the Cow Creek Band of Umpqua Indians, based in Roseburg, OR. Umpqua Indian Foods does its own processing and packaging. The brand has been putting out jerky 1998, selling it locally in nearby stores. Sales increased, but eventually stagnated. In 2004, the company brought in new leadership, redesigned the logo and packaging, and increased production capacity. They've focused on branding themselves as a gourmet jerky, and have gotten their products into stores across the Pacific Coast and in catalogs like Harry & David, and shopping sites like Jerky.com. 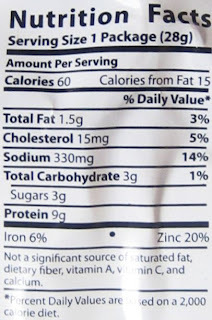 Umpqua Indian Foods uses only pectoral meat (from the shoulder area), instead of the Round which most jerky brands use. 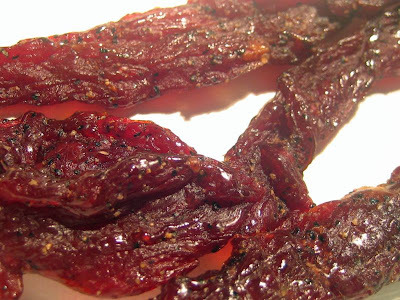 The company claims it's the most expensive meat used in the meat snack industry, and results in a more moist and tender jerky. They go on to explain that their meat is soaked overnight in a brine solution, and then air dried. Beef, water, brown sugar, maple sugar cure (salt, cane & maple sugars, dextrose, sodium nitrite), black pepper, garlic. A very slight sweet taste comes off the surface of these pieces, with maybe perhaps a faint black pepper taste, and that's about it. Going into the chew, the natural meat flavors come out, with some saltiness. That natural meat flavor is generally a good flavor, but it's not very pronounced. It's a smooth mellow flavor, but it doesn't do a good job of dominating the taste of this jerky. It just takes a seat, allows itself to be noticed, without really stealing the show. The "Black Pepper & Garlic" advertisement on this package is only half-way represented in this jerky. I do taste the black pepper, and it does leave its aftertaste in the back of my mouth, but it's just like the natural meat flavors where it doesn't dominate. But the garlic is hard to notice. It does seem to be back there, but perhaps only as a background taste. If I had to decide what the dominant flavor of this jerky is, I'd put it on the natural meat flavors. But don't take that to mean this jerky has a strong meat flavor, it doesn't. It's perhaps moderate at best. In addition, I don't really see this as a "black pepper & garlic" variety; it's more of a moderate black pepper variety, with nary much garlic to taste. This is perhaps better marketed as the company's plain variety, at least that way it would satisfy more. These appear to be strips of whole meat, sliced thick, and in sizes of about 4-5 inches long and the width of a beef stick. I largely see this as a dry jerky, even though the company claims its use of pectoral meat makes this very moist and tender. I think that the "tender" claim is justified, only because I find it easy to tear off and chew, but it's not really soft by any means. I'm not sure the company is getting any advantage from using the more expensive pectoral meat. But it does chew and eat like real meat, and provides plenty of satisfaction in that regard. And it's pretty lean stuff too, I don't see any bits of fat, tendon, or gristle. Jerky.com sells this Black Pepper & Garlic variety from its website at a price of $35.99 for 16 ounces. That works out to a price of $2.24 per ounce, making it an expensive buy. Keep in mind that price also includes the shipping. On a general jerky snacking standpoint, and at that price, it's presents an "ok" value. Generally, it does provide a snackability with a good tasting meat flavor, a decent amount of black pepper taste, and an easy-to-eat consistency, but not really anything to knock me out for that expensive price range. As a Black Pepper & Garlic variety, it's weak value because at that price per ounce, all I'm getting is the black pepper taste, and not much of the garlic. If I were to pay that much for a garlic-flavored jerky, I'd want to finish up smelling like an italian restaurant. It's largely the snackability that gets it to the average rating for this Black & Pepper & Garlic variety from Umpqua Indian Foods. It's seasonings are good enough, its meat taste is good enough, and its ease in eating is good enough, to be a snackworthy treat, but there's nothing here that grabs ahold of my tongue and makes love to it. This would actually make a great treat for doing something else, like watching television, driving a car, or having a conversation with your buddies. It'll work your jaws, and give you enough flavor to keep you satisfied, without doing anything to steal your attention. In fact, this actually might be great with some hummus as a jerky dip. If you have to have a beer with this, I'd go for a brown ale. having just finished the umpqua black pepper and garlic a minute ago, I would give it a an above average rating. definitely more than this review. this guy is right that no flavor is overly pronounced, but that is such an understatement. these flavors work well together, with the garlic and maple sugar taming the black pepper spice to a mild tingle on the lips and tongue. 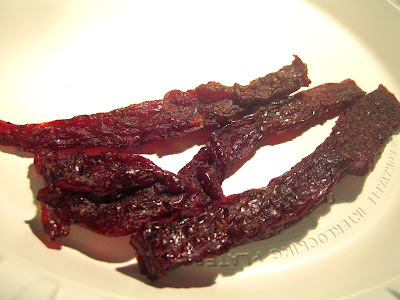 its difficult to find a beef jerky with this good a texture, and a good flavor that doesn't over do it with sugar (an ingredient i normally say shouldn't be on my favorite beef jerky). i would give this a 7.5 out of 10 overall, with a 90% snackable rating.